Is your eye ever caught by a luxurious swath of alligator or crocodile? I have long admired these rich, durable leathers, and own only a few pieces, a retro yellow alligator bag and several croc watch straps. Mom offered me her framed alligator bag, but oh noooo, I wasn't into framed bags then. By the time I caught on, her friend Millie was working it with the matching pumps and I had buy mine at a New York vintage-clothing boutique. 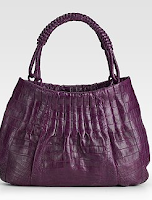 Nancy Gonzalez is the big fashion croc bag designer; her plum pleated shoulder bag sells on Saks' site for $2,850. Because she uses decent but not great skins from caiman crocs, she can keep the price down, relatively speaking. 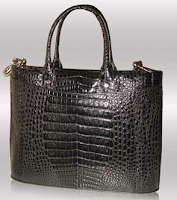 Zagliani small Tomodachi crocodile tote, $10,500 is my lottery-win bag: right size, right shape. Also from Saks, and if you can buy it, you can probably afford to come visit me. I will take you to lunch, place the bag between us, and swoon. 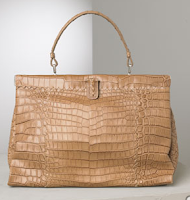 Caramel croc Bottega Veneta tote, $22,680, from Bergdorf's. Arm Ferrari. 1. Quality (scale pattern, softness, and finish) trumps brand. Body section, tanning and finishing processes affect quality of the leather. Cheap, thin skins crack easily and lack life, so I'd avoid eBay except for reputable sellers who provide ample description. 2. Used can be better than new. Popularity has resulted in competition for good skins; you can find vintage bags that beat what's offered in shops. Look for thick yet supple skins cut from the most desirable center belly area, no peeling scales, intact stitching and working hardware. 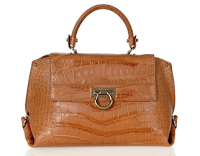 tan alligator bag, $6,475 from Portero. Steep, but far less than the price of a new alligator bag from this house. Elizabeth Arden red alligator satchel, which sold recently for $2,475 from Vintage Skins. A stunner, worth about $12,000 today. 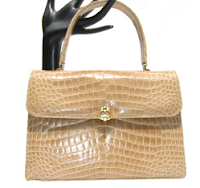 Tip py-top quality, glossy and supple blonde croc bag by Spritzer Furhmann, circa '60s, and in mint condition, 6" x 8.5", $895 from Vintage Skins. My orange crocodile watch strap (about $225) was made by Atelier Jean Rousseau in Paris; they can fill your order by e-mail. Matte finish is more durable than glossy. 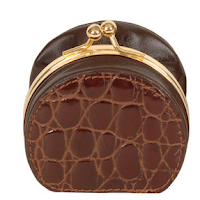 Raphael's coin mini-purse in rich brown, $125, tucks into your handbag or pocket. Would I buy the croc pieces shown below? At this price point, a voice in the back of my head would start saying "Great boots? New coat?" 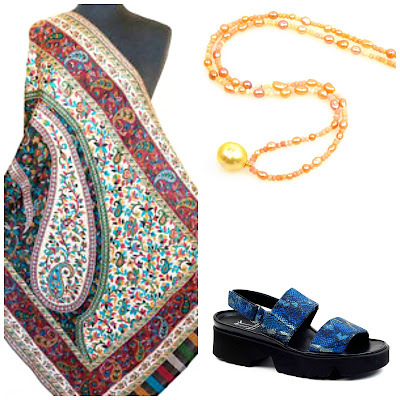 Yet I enjoy beautiful accessories, and these fit the hefty bill. I would love to give these as a gift, or receive one. Nancy Gonzalez crocodile card case, made in many jewel colours, is $390 from Vivre. 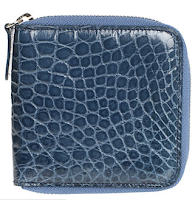 Barney's square zip-around wallet $665, will keep its owner in blue croc joy for years. Alligator gives a man a bit of luxe, too. I think Le Duc would enjoy This M-Clip 'Rodeo' money clip, $250 from Nordstrom, available in many colours. 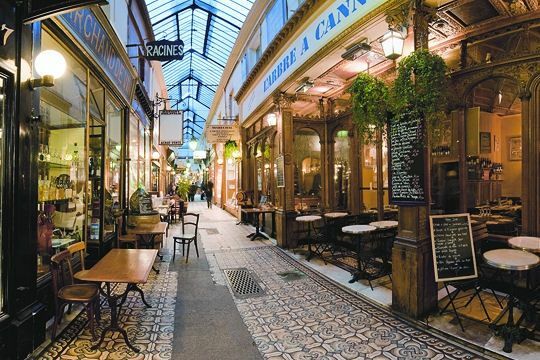 He carries an elderly, patinaed Hermes crocodile Sac malette, bought at auction about eight years ago. I think it's funny that he's the one with an Hermes bag! Staying away from embossed synthetics, there are some good croc-homage products out there. Browns, blacks and burgundies look more realistic than than brights. Longchamps 'Roseau' top zip bucket bag, $360 from Nordstrom, is handsome but let's face it, the full thrill just isn't there. I might carry it, but it would stoke croc lust, rather than satisfy. A compromise is "Ligator", a reptile skin processed to look like crocodile by Gleni Boutique, an Italian firm who sell exotic skins (alligator, croc, python). They use real alligator, which is then covered with a proprietary treatment. The leather is glossy, waterproof and, the manufacturer claims, durable. 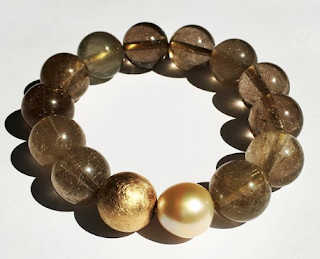 All Gleni pieces come with a CITES certificate that is required for import to non-EU countries. Shown, the 3804 model in black, €490 (About $US 705). Click to see the full line of Ligator bags. You can also find some Ligator pieces on eBay. With a little care (delicate leather cream to keep the skin supple) reptile skins are surprisingly hardy, a good thing given the price. And wear on the piece, like old silver or softly fraying silk tapestry, confers grace. Great topic! Once you carry a croc/alligator bag, your attitude towards bags changes completely. Well, that´s what happened to me. My mother too had a framed crocodile bag, but she gave it away. I´ll never know why. At this certain age, I think we are privileged to something special. Thank you for sharing! At those prices, I'll be living out my days sans croc bag. But I have a watch that needs its leather strap replaced . 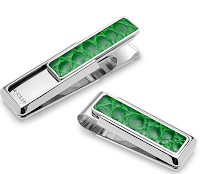 . . what a good idea to have an alligator band -- a mini-hit of luxury! Thanks for sharing that link. I'm curious where the skins come from. Are there croc. farms? Well Done: It's a question to ask whenever you're buying. We have passed up pieces for this reason. CITES (Convention on International Trade in Endangered Species) certified, which means they are from farm raised animals. Great post. I also love the look of ostrich. Luckily, I snatched my grandmother's alligator bag out of my mother's Goodwill donation box! I was too late for the vintage Pucci gown and the real Vuitton bag, unfortunately. I think alligator was endangered for a while and you couldn't even sell/buy vintage items. Now there are alligators galore. I ogled a framed vintage alligator bag at a flea market in New Orleans (pre-Katrina) and have been kicking myself ever since for not picking it up.I think it was around $200 and it seemed so much to pay at a flea market. I'm a huge dummy! metscan: Yes, it does. Though I still carry my one bag only for day and prefer more classic bags to the wild colours. materfamilias: One time they mailed, no problem, another time refused to mail croc- so had friend pick up and bring to Canada. Other times I buy when we are there. Frugal: So that's where your thrift karma comes from! rb: Noooooo! Hope you can find one again. $200 is a fair price if bag is in excellent shape. Tessa: Ostrich, python, lizard- there are other exotic skins to tempt us! Duchesse, I wish I had my mother and aunt's handbags and shoes. They sported those in the 50's when faux was not yet a word in English. But I'm still reminded of my previous thought about wanting the best as we age. Do you long for real in your younger years? Duchesse: Last year I ordered a NG croc clutch online, and had to send it back cause the scales were cracking off. I don´t think that this was a Monday version. After that experience, I have become very suspicious of the brand. Looking at the latest designs, well, I don´t think that they are flattering at all, on the contrary. In my opinion, if you have an intention of investing in a croc/alligator bag, pay some more to get yourself a decent bag. metscan: Doesn't surprise me; I listed NG bags as price comparisons but they're too 'designery' for me. When Le Duc sent his briefcase to Hermes for repair (it is likely 20+ years old) they charged nothing "out of respect for the pieces". Which brand would you consider the most luxurious using ostrich or croc, in terms of manufacturing and perception of lavishness and luxury? Anonymous: The easy answer is Hermes, because I've seen their exotic skins over decades, some dating to the 1950s. But my exposure is limited, for example, I have never seen some of the fine Italian products, and expect they make some extraordinary examples. I've seen superb pieces at Asprey and Loewe, too. 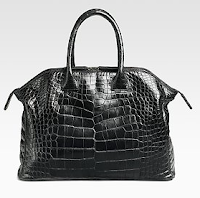 The best exotic bags/accessories (croc/ostrich) I've ever seen are from: Bottega Veneta, Celeth, Judith Leiber. Basically because they are making no concessions using the best material/solutions money can buy, resulting in an incredible quality. BV may fails here since they are very commercial, don't do double-sided exotics, etc. Anonymous: I buy Hermes only at their boutiques. Prefer quite simple bags, which is why I didn't think of Judith Leiber. The Zagliani bag shown would be my ideal.